Malaysia’s toppled leader Najib Razak will go on trial this week over an extraordinary financial scandal that contributed to the downfall of his long-ruling coalition and reverberated around the world. The former prime minister and his cronies are accused of stealing $4.5 billion from Malaysian sovereign wealth fund 1MDB in a mind-boggling fraud that stretched from Switzerland to the Seychelles. The money was purportedly used to fund a global shopping spree — a $250-million super-yacht, high-end real estate, and Monet and Van Gogh artworks were among the items allegedly bought with cash plundered from public coffers. The scandal ensnared celebrities, with the fraud’s suspected mastermind seen partying with Leonardo DiCaprio and Paris Hilton, while the new Malaysian government has accused Wall Street titan Goldman Sachs of stealing billions during its work with 1MDB. Public revulsion at the graft allegations played a large part in the election defeat of Najib — who set up the fund — and a coalition that had ruled Malaysia uninterrupted since independence from Britain in 1957. Since his shock poll loss in May, the 65-year-old has been arrested and hit with 42 charges linked to the scandal. He has vehemently denied any wrongdoing. Far from keeping quiet, the aristocratic ex-leader has mounted a publicity blitz, seeking to present himself as a man of the people and constantly hurling jibes at the new government. 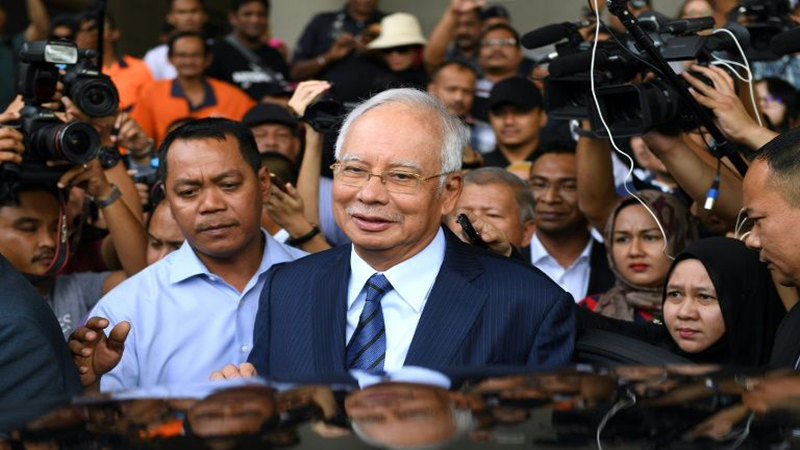 This week’s trial, starting Tuesday, centres on allegations that 42 million ringgit ($10.3 million) was transferred from SRC International, a former 1MDB unit, into Najib’s personal bank accounts. The case involves three counts of money-laundering, three of criminal breach of trust — where someone is accused of dishonestly using something entrusted to them — and one of abuse of power. Najib has pleaded not guilty to all the charges. It is just one of several trials Najib is expected to face over 1MDB and involves a fraction of the total purportedly stolen from the fund, and the $681 million that allegedly ended up in his personal accounts. But the start of the first trial is nevertheless a key moment, and may relieve pressure on the new government following criticism that it has been slow to act over 1MDB. “It’s an important moment, albeit a very delayed one,” said Cynthia Gabriel, who was a member of a government committee set up to investigate the scandal. “It is very critical for the new government to address and resolve past scandals,” added Gabriel, head of the non-profit The Center to Combat Corruption and Cronyism. The former leader and his defence team have portrayed the cases against him as revenge by the new government led by 93-year-old Prime Minister Mahathir Mohamad, Najib’s mentor-turned-nemesis. Muhammad Shafee Abdullah, Najib’s chief lawyer, labelled the upcoming trial “political”. “If you give me a straight judge, a straight system of justice, and the witnesses are left to themselves without being coached, I’ll win this case,” he told AFP. Trial dates have been set until the end of March and prosecutors are expected to call dozens of witnesses. In recent weeks, Najib has transformed into an unlikely social media phenomenon, gaining a large number of followers online by attacking the new government’s policies and posting pictures of visits to homes where he talked to people about economic problems. Published in Daily Times, February 11th 2019.